Product and ordering information for the Dispensette S Trace Analysis bottletop dispenser for accurate and precise dispensing of high purity laboratory chemicals and reagents. NEW! The Dispensette® S Trace Analysis is the next generation bottletop dispenser for precise volume dispensing of high-purity media for trace analysis. 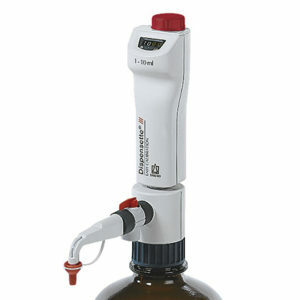 It is especially suited for dispensing acids, bases and hydrogen peroxide in the volume range from 1 to 10 mL. The components of the fluid path have been selected to only contain the highest purity materials, such as fluoroplastics and sapphire. The result is a trace metal content of dispensed liquid generally in the low ppb range, or even in the low ppt range, depending on the application. Both platinum-iridium and tantalum valve springs are available for application compatibility. 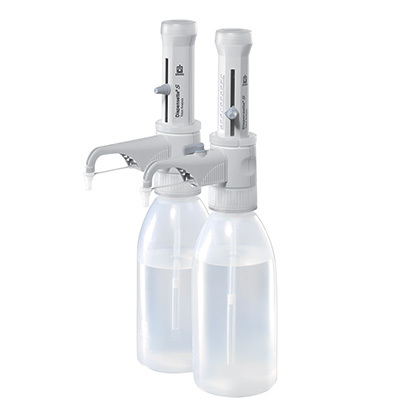 The Dispensette® S Trace Analysis bottletop dispenser is supplied with: discharge tube, valve mounting/calibration tool, ETFE and PTFE adapters (GL28, GL32, S40), telescoping filling tube, recirculation tube (optional), performance certificate, operating manual, and one year warranty. What can I dispense with the Dispensette® S Trace Analysis? The Dispensette® S Trace Analysis is specially designed to dispense high-purity chemicals, with trace metal content of dispensed liquid generally in the low ppb range, or, depending on the application, even in the low ppt range. The platinum-iridium model is suitable for dispensing Hydrofluoric acid (HF), while the tantalum model is suitable for dispensing Hydrogen peroxide (H2O2). Additionally, the Dispensette® S Trace Analysis can be used to dispense Bromine since the ball valve, composed of Al2O3 sapphire, is denser than the ball valves in the Dispensette® S or Dispensette® S Organic. See the Dispenser S Trace Analysis selection chart for a complete list of compatible reagents: click here. My Dispensette® S Trace Analysis seems to leak at the base, especially after priming. How do I stop this? My Dispensette® S Trace Analysis is drawing up bubbles and liquid? What should I do? Your Dispensette® S Trace Analysis has an air leak somewhere. Good places to look are at the junction of the filling tube and filling valve. If it does not make a tight seal, trim some of the tube off, and reattach. 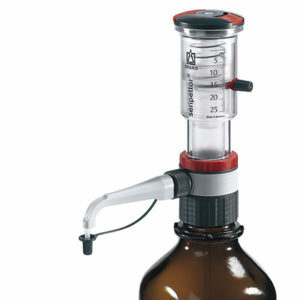 Check to see if the filling and discharge valves are tight. Lastly, is there any liquid in the bottle? The cylinder of my Dispensette® S Trace Analysis doesn't fill. What is happening? There are several different causes that could keep a Dispensette® S Trace Analysis cylinder from filling: 1) The discharge tube is not fitted properly. Check to ensure it is attached properly. 2) The filling valve is not tight or the filling tube is not pushed in enough. 3) The filling valve is dirty and/or stuck. This case can be determined easily because the Dispensette® S Trace Analysis piston will be difficult to lift, and it gets "sucked back down" when released. If the filling valve is dirty, clean the valve. If it is simply stuck, follow the instructions in the Operating Manual for loosening the ball valve (under 'Replacement of discharge tube/valves'). Is the Dispensing Cartridge replaceable? Yes. The Dispensing Cartridge for the Dispensette® S Trace Analysis is a replacement part. 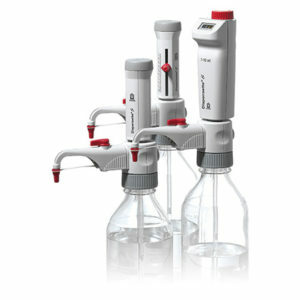 It is catalog number 708035 - Dispensing Cartridge with Safety Ring - and comes calibrated with a quality certificate. The SOP for the Dispensette® S Trace Analysis is available here. Additionally, all of the SOP's for BRAND's liquid handling instruments, as well as the BLAUBRAND volumetric glassware are compiled in EASYCAL™ 4.0 for easy reference. A wide range of parts and accessories are available to even further improve upon the safety, conservation, and productivity features of the Dispensette® S Trace Analysis bottletop dispenser. 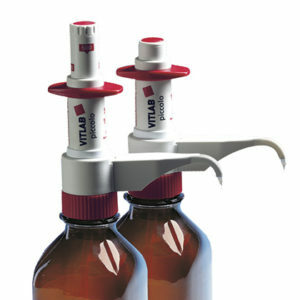 Bottletop Adapters - Thread adapters, available in a wide variety of sizes, ensure compatibility with most reagent bottles. Discharge Valves - Replacement discharge valves available with Platinum-Iridium (Pt-Ir) or Tantalum (Ta) spring valves.